Finally, a traditional production of The Scottish Play that manages to feel surprisingly young, spry and good as new. If only poor Banquo could say the same. Macbeth. There. I’ve said it. Aloud. So once every last one of you theater-lovers has finished walking in circles and spitting in doorways so ghosts do not haunt your opening nights and unwrap noisy otherworldly candies through your recognition and reversal monologues, perhaps we can just sit down like normal well-adjusted adults and talk about The Scottish Play. Wonderful, because the New York Actor’s Ensemble’s current production of Macbeth is worth talking about. There are no gimmicks in this show, no single-gender casting, WWII updating or disco interludes – this here is pure Shakespeare. Very little text was cut, yet somehow the play whizzes by, action-packed, seamless, and vastly entertaining. 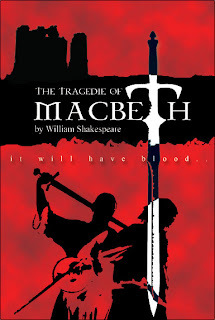 Of course, there are bumps along the way, but, on the whole, NYAE’s Macbeth was what our professors always told us Shakespeare should be -- riveting, gross, raunchy, insightful and very entertaining. Of course, our anti-hero Macbeth (played by the excellently on point David M. Mead) does the same thing he always does (next time, just ignore the Weird Sisters! ), but Mead brings a approachable just-your-average-guy quality to the role. This is a Macbeth who snuggles up in his new royal robe when no one else is watching – the snuggle lasts only a simple split second, but it subtly expresses both the satisfaction he must be feeling and the intense insecurity. This Macbeth is understandable and relatable – two very welcome attributes in any Shakespearean production. Mead encourages our compassion through these small human gestures, yet isn’t afraid to make us recoil; whether blood-stained and searching for that sticking point or ranting over the now-you-see-him-now-you-don’t Banquo, Mead’s Macbeth somehow holds strong as the center of this play’s success, even as the character himself unravels into tragedy. Kenneth Cavett, taking on the role of Banquo, also presents a stunningly complex and sympathetic character, though, granted, it is much easier to be Mr. Popular when you’re discovering the murderer instead of wielding the gory blade yourself. Still, Cavett’s Banquo is the early pulse behind the show, stirring the demons in Macbeth long before Banquo suspects there is anything to fear, jumping around with childish excitement at the Weirds’ mere mention of “king.” Together, Cavett and Mead keep the production moving, leaving the audience rapt up in the action, of course, but far more impressively, in the language as well. The same cannot, unfortunately, be said of Lady Macbeth, played by the chiseled-featured Susan Angelo. Lady Macbeth is indeed the pinnacle of the complicated female, so one can’t blame Angelo too much. However, why is it that almost all actors playing Lady Macbeth play her with the mannerisms and facial expressions of a drag queen taking the stage after five too many daiquiris? It’s the Blanche DuBois Dilemma – when an actress starts crazy in Act One, where’ll she go for Act Five? Sure, she can always make the jump from crazy to crazier, but with Lady Macbeth, that’s just spitting in one enormous blood-red ocean. On the topic of enormity, the stage is, well, not. And while the size of the performance space shouldn’t make or break an otherwise rewarding production, when the play is Macbeth and the first scene involves a bevy of men stage-fighting in multi-colored plaid skirts, size does matter when the kingdom in contention is roughly the size of a New York City kitchen. Furthermore, when the show’s set is a miniature version of Stonehenge, it’s only natural for This is Spinal Tap to pop into my mind. And, call me as crazy as Lady Macbeth, but when I go out for a little high culture, the last thing I want on my mind is a trio of dancing midgets. Overall, though, Macbeth is an exciting production, entirely worth both your time and your superstitious spits (just not on the teeny tiny stage, please; you might flood Stonehenge). Performances: January 5th through January 21st, Wednesdays through Fridays at 8pm, Saturdays at 1pm and 8pm, and Sundays at 4pm.